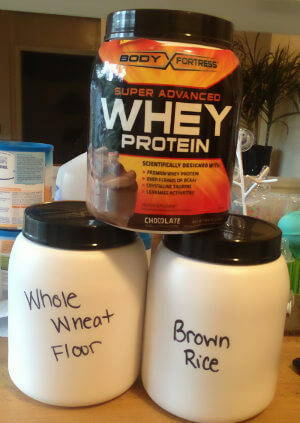 Home » What To Do With Old Protein Tubs? What To Do With Old Protein Tubs? Don’t just toss them in the trash – old protein tubs have a bunch of uses! So to save a bit of landfill here’s some quick ideas for empty protein containers. These are sturdy tubs, and they are food safe – after all, your protein came in them, right? So why not use them to store flour (oooh, carbs), rice, oatmeal, lentils, beans. Heck, keep your stash of protein brownies, cookies or muffins in them. Label them with a big marker pen, use chalkboard paint and chalk, or attach a paper label with sticky tape. If you feed a dog, cat, other furry critter on any kind of dried food, then protein containers are perfect. 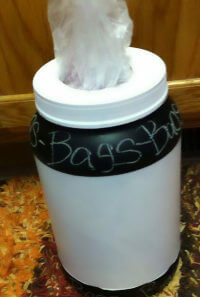 Get rid of that massive dog food sack – fill up a 5lb tub, store the sack in the garage. Legos, blocks, craft stuff – anything that ends up scattered on the floor making it a health hazard to walk across a room. Big plastic protein tubs are ideal for this. Label them up nicely if you like. Cut a hole in the lid – stuff your spare plastic bags in it. Easily pull them out as and when you need them. Can you believe people actually spend good money on buying things to store plastic bags in for reuse..? If you’ve got endless nuts, bolts, tools and endless ‘useful stuff’ in the garage or tool shed – throw a dozen protein containers at the mess. OK, not literally :-). The only drawback is you can’t see inside them, but they are a lot safer than using jam jars which will get broken at some point – so just label them with a big marker pen. Or to keep things more visible and easy to grab, you can also cut a tub in half (length ways) to give you two ‘trays’! You can sit a whole row of these on a bench top, or even screw them to a panel or wall. 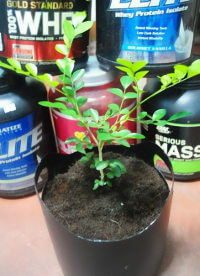 Grow A Plant Or Tree In Them! Punch a couple of holes in the bottom for drainage, fill with soil/potting mix. Grow something! Or if you want to get fancy, you can even cut the sides away to make carrying handles. Donate Them Or Last Resort – Recycle Them! If you’ve got enough, reused enough – even made things for friends and family – and just plain don’t need any more of the darn things. Then there’s still no excuse to put them in the trash. First – see if a local charity store would like them, either to store their own stuff, or to sell for a nice charitable profit. Your final last resort though is to recycle them. Check the bottom, look for the plastic recycling code – it’s extremely likely that you can recycle your containers. Copyright © WorkoutSupplementReviews.com. All Rights Reserved.